Three months later, after learning how to be an intuitive eater, she was thrilled to experience what it is like to eat normally and now sees that she can eat food without overindulging or losing control. 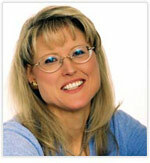 Joyce learned the 3 secrets of intuitive eating. People who eat normally do not count calories to manage their portions. Instead they wait to get hungry to eat, and then they stop when they are satisfied without getting full. It is not something they have to think about; it is intuitive and something they just do. Infants do the same thing. We all have this ability, and it is amazingly simple to regain with a little awareness. Joyce was shocked to learn she did not know what it felt like to get hungry or get full. She had never paid any attention to that. All she had ever focused on was what she should or shouldn’t have or how many calories she was avoiding or overeating. Yet within just a couple of weeks, she was finding it easy to recognize her hunger signal and eat when she got hungry. She was also amazed that she did really know when she had had enough and could stop before getting full. The best part was; she felt so much better and she no longer had to worry about portions. She was getting exactly the right amount of food to fuel her metabolism and her energy levels by trusting her hunger levels and intuition. Even if you are aware of getting full or grabbing food when you aren’t hungry, you may feel powerless to stop yourself. So why is that? What is really driving you to eat when you aren’t hungry? Do you know? Most people have absolutely no idea and assume it is because they have no willpower, are simply bad or just can’t help it. But that is not what is really going on. Something is driving you to eat, and you can figure it out with a few simple questions you can ask yourself out of curiosity rather than out of self-judgment. Do I feel like I need a reward? Is this a food I know I shouldn’t have? Am I eating this because I think I should or have to? There could one or more of these subconscious drivers affecting the way you are eating, and once you spot them you can start to resolve them. Consider if there are other ways to resolve what is bothering you or another way to get rewarded. Determine if your beliefs about food or the need to eat for someone else at your expense really makes sense, and if not, change your internal rules. And notice if you are eating because you stopped paying attention or because what you are eating is something you automatically associate with something else you are doing. Once you are aware of these, you can be more conscious of your choices. As Joyce began to ask herself these questions in an attempt to better understand herself, she discovered that she often felt deserving of a reward when she got home from work. Her favorite food reward was crackers and cheese before dinner. If she didn’t have an afternoon snack and was famished, she would eat these to the point of feeling sick, and then skip dinner. If she had a stressful day or deprived herself during the day, trying to be good, then she would keep on eating, usually bingeing for hours on cookies, ice cream, or anything she could find that would satisfy her need for sweets. Those nights she usually slept poorly and woke up feeling groggy and sick. Joyce could finally see what was going on and that bingeing didn’t satisfy her cravings; it just made her feel worse and unsatisfied. The common reaction is to try to be better and avoid having bad foods in the house, but that doesn’t work for long. You have to address your needs, including your need to get rewarded, to be fully satisfied by the food you eat throughout the day, and to validate and address your emotional stress. Joyce discovered that giving herself permission to have a small treat at least once a day, getting in an afternoon snack and finding other ways to reward herself made all the difference. Almost overnight, she stopped craving sweets and bingeing. It was practically effortless. When you listen to your body and what feels best, while identifying and resolving food triggers, an amazing thing happens. You start to want healthier foods, and it happens naturally. This was a huge surprise to Joyce. Within a few weeks of starting her coaching sessions, she found herself craving broccoli. The next week she wanted to try roasting some vegetables, and then she began asking for extra vegetables when she went out to eat. She couldn’t believe she was the same person. She told me she felt like her body had been taken over by a vegan and she was excited to start cooking healthier recipes. I have seen this happen repeatedly. When you are aware of how you feel and resolve your subconscious eating issues, you naturally gravitate to healthier foods intuitively. You don’t have to force it; it comes easily by choice. You can eat normally like other people when you follow these 3 simple steps. This is the time of year when every where you turn there are sweets, parties and holiday networking events. It is hard to stay in control and avoid indulging, particularly when you are stressed or trying to fit so much into your schedule you can hardly find time for a decent meal. Yet you probably don’t want to find yourself in January unable to zip up your pants and wishing you had found a way to control yourself. The good news is being in control is much easier than you may have thought. Here are 3 steps to avoid weight gain during the holidays so you don’t find yourself a size larger in the new year. You can’t change your behavior if you aren’t really paying attention to what you are doing at the time you are doing it, and few people are conscious when they put food in their mouths. Eating is something we do without being aware of whether we are even hungry, if something other than physical hunger is driving us, or even when we have already gotten full and are beginning to feel sick. Most likely you are eating without even knowing why you are doing it, and the only way to be in control is to start noticing the difference between physical and non-physical hunger. It starts by noticing every single you time you start to get full, and to notice with interest – not judgment. Once you start doing that, you may find you don’t like the way it feels. You can also notice each time to reach for food if you are actually hungry and in need of that food. You may also find in many cases that you aren’t eating for physical hunger. So what are you eating for? If you aren’t eating because you need the food, something else is driving you to eat. That doesn’t make you wrong or bad. It just means that your behavior is being driven subconsciously, which makes being in control very difficult when you aren’t aware of what is driving your actions. The most common drivers during the holidays are Mindless Excess, Ravenous Response, Restricted Rebellion, Emotional Repression and Subconscious Beliefs. These are five of the eight common reasons people overeat that I address in my book Inspired to Feel Good. The most important thing you can do for yourself during the holidays is to avoid dieting, which is a trigger for rebellious overeating when you inevitably blow it. Instead, eat because you are hungry and then choose foods that leave you feeling good physically without feeling deprived emotionally. If you pay attention to how your body feels, you will know when you need food, when you’ve had too much and when food doesn’t really agree with you. You may even discover foods you thought you enjoyed don’t actually taste all that good. Give yourself permission to have foods you love without getting full, and ideally pair the sweets and “>holiday treats with a balanced meal or snack. That way you will avoid getting sugar rushes and feeling sick. You will also keep your blood sugars and metabolism better balanced, and you will be able to feel the difference. Focus on eating what leaves you feeling good physically and emotionally, and you will be surprised to see you may naturally gravitate to healthier choices and combinations. Have a great holiday feeling free to enjoy yourself without the guilt or the weight gain! When I first met MaryLou, she said her biggest issue was emotional eating. She ate frequently when she wasn’t hungry and felt compelled to eat junk foods when things didn’t go well. That certainly suggests emotional eating, but it could also be the result of other eating issues or subconscious triggers. Emotional eating is often used as a catchall for any eating that isn’t based on a physical need, such as overeating, eating when you aren’t hungry or eating lots of unhealthy foods. Yet there can be many reasons for these things, and until you have a clear understanding of the real issue you can’t solve it. MaryLou was taught at an early age that junk food was bad and that she could only have it for special occasions, like when she had a good report card or on her birthday. On those days, she could have anything she wanted and as much as she wanted. She remembers those events vividly, because she gotto indulge in lots of chips, candy, cake and ice cream, and then she often got sick. But it was always worth it to her. Unconsciously, she believed that going on a binge as a reward for doing something well or on special holidays was her right and that feeling terrible afterwards was to be expected. Of course, as an adult, she got to decide what was a special occasion or worthy of a reward, and instead of a few times a year she overindulged a few times a week. This is a form of eating driven more by a belief than an emotion, although it can trigger emotions as I will describe with restricted rebellion. Other unconscious beliefs that drive food behaviors include: eating everything on your plate, not wasting food, getting your money’s worth, leftovers are bad, healthy food is too expensive, healthy food doesn’t taste good, and many more. You can probably add a few of your own to this list. MaryLou’s belief about junk food created a dynamic that led to another type of eating, where she felt emotionally deprived on the days she wasn’t being rewarded or celebrating. As she enforced the rule that she couldn’t have the food she craved except under certain conditions, another part of her rebelled against this rule. That part of her wanted the cookies, chips and chocolate all the time, because it wasn’t sure when the next reward was going to be and felt deprived and restricted by her strict belief. So when she finally did give herself permission to have these foods, she went on a greater binge to make up for feeling deprived between binges. This rebellion against being restricted of food or specific foods is one of the most common forms of emotional eating. Whether you feel should be restricted by the beliefs you carry, were recently restricted by a diet, was restricted as a child or anticipate being restricted by an upcoming diet; you have a high likelihood of having an emotional reaction and overeating that food or foods to make up for not getting your needs met – whether you really want or like the food or not. You won’t be able to help yourself. MaryLou had thought her biggest issue was eating when things didn’t go well, so discovering that she was out of control with food when things went well as a reward had been a huge eye-opener for her. Yet her reward eating had a common relationship to the times she ate to cope with challenging or upsetting situations. In both cases she had a lot of emotions, but she wasn’t acknowledging them. Instead of feeling deserving and celebratory when things went well or feeling angry and frustrated when they didn’t, she turned to food and pushed those feelings down into her body unexpressed. This is classic emotional eating. And then because overeating and eating junk food made her feel badly about herself, she then ate more in an attempt to avoid feeling ashamed for what she was doing. Again, this is typical with emotional eating. When you repress either positive or negative emotions by turning to food to feel good, you lose the ability to really feel and express your feelings or to get your needs met that are associated with those feelings. In MaryLou’s case, she wanted to feel rewarded for the things she was proud of, and that is a valid feeling and need. But overeating junk food didn’t fill that need. Instead it made her feel worse and unfulfilled. She also had valid emotions when things didn’t go well, but the more she repressed them the bigger those emotions became so she was easily triggered when the littlest of things went wrong. She also hadn’t resolved the situations that upset her, so she felt more and more out of control and more often turning to food. To MaryLou’s surprise, as she got to observe her eating patterns working with me, was how often she ate to please other people. She had no idea that was happening. There were many times during the week when she met people for coffee, lunch, dinner or went to networking events. Often she ate when she wasn’t hungry or had already become full, because she felt she needed to. If the person she was with wanted to share a pastry or dessert, she felt she had to say yes. If others were still eating, and she was done, she felt she had to eat more so they wouldn’t be uncomfortable that she was not eating. If she was offered an appetizer, she felt she had to have one so the waiter felt appreciated. If she didn’t eat everything on her plate, she worried the chef might think she didn’t like the food. Or if she wanted to order a light salad and others asked whether she wasn’t going to get more, she felt she should get something more substantial. In the end, she almost always overate and ate something she didn’t want. Yet the people around her probably didn’t even really care what she did or didn’t eat. She was creating her own story about what these people were thinking and then tried to meet what she perceived were everyone’s needs but her own. 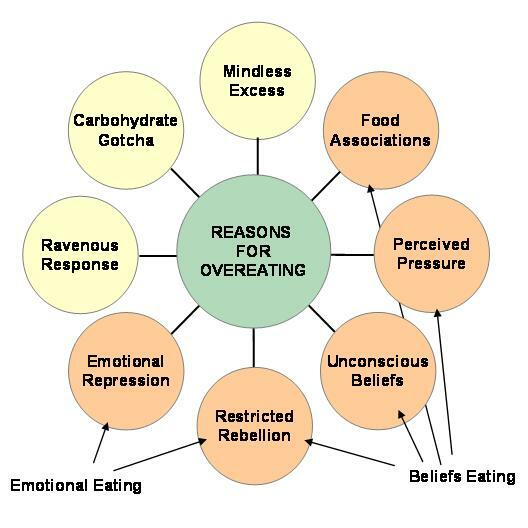 As you can see, emotional eating is a mix of beliefs and emotions that subconsciously drive eating patterns, and everyone has their own unique set of beliefs, emotions and needs. Because everyone is different, I have only touched the surface as to the many ways these can appear for someone. The trick is to be able to see what is really driving your own eating choices and behaviors without judgment, and then to change the specific beliefs, feel the specific feelings and get your real needs met. If you simply call everything emotional eating, it will be much harder to detect what is really driving you and how to finally address the exact beliefs, feelings and needs. Clair prides herself on being really good when she diets, until she isn’t. And then she is really really bad. She can’t seem to help herself. The moment she gets derailed and succumbs to food she knows she shouldn’t have, she is taken over by an insatiable desire for all the foods she’s been denied the past few weeks. The pattern is always the same. Then there are people like Betsy, who are really good during the day, only to leave work and find themselves unable to stop their desire for fast food, ice cream, chips or cookies. Betsy would head to the closest convenience store after work, where she loaded up on cookies, an ice cream bar and candy, and then hurriedly ate it all on her commute home. Mike did the same, always stopping for some candy. Nancy never stopped; she would go straight home, but then raid her cabinets for any junk food she could find, feeling as if possessed by a demon. Why she would ask me, as the others did, am I so bad at night after being so good during the day? For the same reason dieters go on a binge the night before their diet starts or right when it ends. I call it restricted rebellion. You can also call it the deprivation-binge rollercoaster. When you have been restricted or deprived of foods you want, you want them all the more. And then when you get your hands on that food, you feel compelled to eat as much as you can while you can, knowing you are bad and it has to be the last time. That self-imposed belief that you should and will be restricted again creates an emotional need and child-like rebellion against that very restriction. In addition, eating food you believe you shouldn’t have creates guilt, anxiety and a self-loathing that is soothed by eating comfort food, temporarily relieving the feelings with a dose of happy denial. Another name for this is emotional eating. The answer is to give yourself permission to have all the foods you love as part of your diet. You can call it cheating, but that only recreates feelings of being bad and guilty, which drive emotional overeating and bingeing. Instead, cheating only works when you don’t believe it is cheating. Cheating suggests there are bad foods you shouldn’t have, and that if you have them you are bad and will either gain weight or not be able to lose weight. That is simply not true. You can eat any food in moderation, particularly if it is part of a healthy balanced diet. This is what Clair, Mike, Tiffany, Nancy and Betsy learned. By eating more of the foods they wanted during the day in a healthy way, they no longer felt deprived or in need of rewarding themselves for being so good in the evening or when their diets stopped. It was. She was no longer being driven by her inner child rebelling for more or by her need to stifle her guilt. Now she could actually focus on tasting her food and being fully satisfied with less of it. When you don’t let yourself have what you want, you will eat excessively in an attempt to gain that elusive satisfaction. Better to go ahead and cheat, and let yourself have the food you love. You will have less of it and have greater success with achieving and maintaining weight loss. Many people believe they are addicted to sugar, simple carbohydrates or other specific foods, because they crave them all the time and then seem to go crazy on a binge when they gain access to them. There is a good argument to support this belief in Dr. David Kessler’s book, The End of Overeating, which puts the blame on the food industry for developing foods specifically to create this uncontrollable preoccupation and compulsive eating. Yet, having worked with many people who struggle with cravings, binges and a belief they are addicted to certain foods, I know the issue is just as much driven by subconscious factors as bio-chemical ones. I also know you don’t have to give up these foods to be in control of them, as he strongly recommends. Dr. Kessler’s research findings conclude the reason people crave specific foods is the combination of fat, sugar and salt often used in those foods to stimulate dopamine in the brain, which feels really good. Once you’ve had a food with this combination that stimulates arousal, you’ll want it again and again. This is certainly an important breakthrough in understanding why people are irresistibly drawn to food that isn’t healthy and struggle to stop eating even when they are full. No doubt, the food industry has taken full advantage of this potent combination, putting them in processed and fast foods where you’d least expect to find them, to keep people coming back for more and boosting their profits. One approach to dealing with this is to simply stop eating all types of desserts, packaged and processed foods, fast foods, and most restaurant meals, and replace them with healthy whole foods with no sugar, fat, salt or emotional triggers. And that will indeed eliminate the cravings, for a while. But like dieting, very few people can stick with eliminating foods they enjoy long term without feeling deprived. While Kessler acknowledges this problem by suggesting you rewire your circuitry by creating unappealing images of the food, this doesn’t address the real issue of deprivation backlash and the need for food satisfaction. A better way to address foods that are designed to trigger cravings is to incorporate them into a healthy diet, so they are balanced with other foods to create satisfaction. Satisfaction is an important element of eating, and you are just as likely to overeat in an attempt to reach satisfaction as you are when you are over-stimulated by too much satisfaction. 1. Pay attention to how hungry, satisfied and full you feel. If you don’t know when you are satisfied physically or when you are full, you won’t realize you are overeating or appreciate how unpleasant it feels to get full. 2. Identify the food for what it is instead of calling it a bad food. Most highly stimulating foods, like cookies, are primarily a simple carbohydrate with saturated fat. It is harder to tell if it has much salt. 3. Balance this food with other foods that have complex carbohydrates, unsaturated fats and lean protein. If you want a cookie, then the trade off is to not have simple carbs or saturated fat in the rest of your meal or snack. When most of what you are eating is really healthy, having a little less healthy food doesn’t throw off the balance or make it unhealthy. 4. Give yourself permission to have this food in moderation when ever you balance it with healthier foods. When you eat food you think you shouldn’t, it creates a feeling of guilt and reinforces the belief that you should be deprived of it. This fuels emotional and rebellious eating, giving the food power over you. To take back your power, you have to stop seeing the food as a guilty pleasure or a forbidden food. 5. Really taste this food to see how much you enjoy it. When you aren’t over-stimulated or concerned about being deprived, you can more easily focus on tasting the food you crave. Most people find it isn’t as good as they thought and that healthier foods actually taste better. 6. Focus on creating satisfying meals with healthier foods. The more you remove the charge of highly-stimulating foods by allowing them in balanced moderation, the more likely you’ll gravitate to choosing healthier ways of being satisfied without feeling forced or deprived. This approach, which is the basis of Intuitive Eating, addresses the emotional and bio-chemical cravings for foods designed to get us hooked. The less we eat of these foods, the less the food industry profits from them. This week, I asked everyone to share a significant change in the way they were eating since starting the New You program, and to pick an area they had listed in their contest application as a major problem they wanted to solve. It was amazing to hear just how much had changed, and how easy it had been to make the changes. To date, they have been shown how to pay attention to their body’s hunger, satisfaction and fullness levels, the basics of nutrition, and how to balance all foods in moderation – as you’ve been reading in this blog. They have been encouraged to notice how different foods or beverages leave them feeling, and to stay conscious when they eat so they can remain in control. They have been discouraged from labeling any food as bad or criticizing themselves when they are challenged to pick healthy choices or in controlling portions. They have not been put on a diet, been restricted in any way, or been told what to eat or not to eat. There has been no judgment about their choices, but instead a focus on feeling good physically and satisfied emotionally. And the results within just six weeks are impressive, because no one feels pressured, forced or restricted. Instead they have changed their mindset and been given freedom to do what feels best and works best for them. With this approach, they have all easily, intuitively and naturally gravitated to healthier foods and beverages, low-glycemic balanced foods, smaller portions and more frequent meals. And they have done it by choice, not to win an award or to lose weight fast. Instead they have done it because it just feels and tastes so much better. Here is a summary of what has changed during the past six weeks across the 4 groups participating in this New You 2010 program, including the contest group. Nearly everyone struggled with portion control and wanted a way to manage how much they ate, particularly at night, when entering the program. When they first started paying attention to when they started to become full, many found it didn’t feel good and others discovered they had no idea really what fullness felt like. Now, everyone has easily shifted to eating when they get hungry and stopping before they get full, with perhaps a couple of exceptions during the week, and even then they almost never overeat by that much. As several people said this week, they just don’t want to eat beyond the point they are satisfied and it has become easy to simply stop. They have found, whether they journal or not, that they are remaining conscious of their hunger and fullness levels when they eat, which is changing their behavior naturally. Others pointed out that by getting enough to eat during the day and not getting too ravenous before dinner, they are more in control and don’t overeat at night. Some noted they are easily taking food home when they go out to eat, which is something they never used to do. When most of them filled out their applications, they wrote about the struggle to make healthy choices and many of them shared they weren’t sure if they had or even knew how to eat healthy meals. So many of them had dieted, and sadly diets are seldom healthy. Now they are gaining confidence that they know what is healthy and are making healthy meals and snacks. They have been experimenting with the foods they already eat, and finding ways to make them more nutritionally balanced with other foods or by finding healthier alternatives (such as whole grain vs refined flour pasta). They haven’t had to change the way they eat drastically. Instead they have made minor modifications and begun experimenting with new recipes. As importantly, they are combining foods in a way they find most satisfying, so they don’t feel like they are being restricted or being put on a diet. Many of them shared how much they were enjoying their healthier choices and how much better they felt physically and mentally. They are discovering how to balance foods that give them more energy, last a few hours, and taste so much better than what they used to eat. In the process, quite a few of them are getting excited about cooking, trying new recipes and checking labels to make healthier purchases. Some are figuring out better ways to plan their grocery shopping and prepare foods more effectively. And, many of them are finding they want more fruits and vegetables, so we talked a bit about ways to more easily and quickly prepare vegetables. We will also have Katie Habib, our personal chef sponsor from In Home Cooking, do a class for us on ways to plan and prepare vegetables in April or May. As I explained to the groups early on, there is always a good reason for overeating and bingeing. The trick is to uncover the subconscious trigger driving you to eat when you aren’t hungry or are already starting to get full. The first step in doing that is to simply observe with curiosity when you overeat and not judge it. Very often the cause is an internal battle between beliefs you are carrying about food (such as food you shouldn’t have) and emotions caused by unmet needs (such as foods you love and have been deprived of). The drive to overeat and binge can also come from beliefs about wasting food, eating everything on your plate and deserving a reward. It can also be the result of using food to repress emotions and using food to cope with what is going on in your life. Nearly everyone had been doing excessive overeating to one degree or another, and now it is very rare. They are seeing what is triggering them and they are either changing their beliefs, acknowledging their needs and finding ways to get those needs met, or they are coming up with strategies to avoid getting triggered in the first place. Several shared how amazing it was to them that they no longer graze after dinner or have any desire to eat foods in large quantities. They might have a little something at night, but just a bit, and very often they are happier having it with dinner as part of their balanced meal. As one person put it, there just isn’t “any desire anymore to overindulge”. Others pointed out that because they no longer feel restricted or deprived and instead have permission to eat what they want in a structured way, they are perfectly satisfied and don’t go looking for more food. A number of people had been drinking a lot of soda or alcohol, which we haven’t talked much about in the groups. For a few it was a big issue, and they have specifically worked to uncover what is driving them to drink so much and to come up with strategies to reduce their quantities. And that has worked really well. For the others, they simply found they didn’t want as much of it and started drinking more water or seltzer water instead. For them, the change just naturally happened because it made them feel better. And for another, what naturally occurred was a greater desire for a higher quality drink than for quantity. For those who felt they had carb or sugar addictions when they filled out their applications, none felt they had these now. The cravings have disappeared, and many believed it was because of their balanced food choices and their ability to enjoy a little of whatever it is they love as a part of their meals or snacks. If they want a cookie, they can have one. If they want chocolate, they can fully enjoy it. And since they are no longer deprived or beating themselves up for slipping, blowing it or being bad, these once forbidden foods don’t hold power over them. Instead, they are eating to be satisfied instead of indulging to make up for what they can’t have or didn’t get to have in the past. What is also making a big difference for a number of them is breakfast. In the past, they were eating primarily carbohydrates and mainly simple carbohydrates (such as a breakfast of cereal, milk, fruit and fruit juice), which was fueling carb cravings the rest of the day. Now, by balancing their breakfast with more complex carbohydrates, protein and fat, they aren’t spiking their blood sugars first thing in the morning, and the desire for carbs has dropped off. As one gal put it, “it doesn’t feel like a sacrifice” to make healthy changes this way, and that is why they are all being so successful. Simply by having awareness when eating, a simplified understanding of nutrition and the freedom to make choices that feel best, they are willingly and intuitively making positive changes they will easily maintain long-term. They don’t have to rely on willpower to do as they should, because there are no rules and restrictions – just common sense that feels good. Find out what the participants have to say about their changes with food, which they usually add the Monday after this post goes live. Please feel free to add your own comments as you follow along. To participate on your own or in a group, check out the contest website for details and tools at www.aHealthyLifestyleWorks.com/contest. This week, the main topic for our group sessions was balanced eating and how to easily make healthy meals and snacks without it being complicated or restricted. These days it isn’t easy to make healthy food choices, and one of the problems is the confusion about what is and is not healthy to eat. You can make yourself crazy trying to figure out the latest research or trying to sort out everything you’ve learned about good nutrition. A number of people who applied for this contest told me that they weren’t sure how to pick healthy foods and some admitted they weren’t sure they had ever had a healthy diet, largely because of all the dieting they had done. And that makes sense, most diets aren’t healthy and all the noise about good foods and bad foods are often contradictory. The good news is, healthy eating doesn’t have to be complicated. Once you know the basics about nutrition and how to easily balance foods, it is actually very simple and gives you a lot of freedom in your choices. I call this Balanced Eating, and it is a way to make meals and snacks that are nutritionally balanced, satisfying and provide a low glycemic impact. Why low gylcemic impact matters. Carbohydrates are rated on a glycemic index by how fast they break down and raise blood sugar levels, and those with a high glycemic index (often called fast carbs or simple carbohydrates) break down the fastest, causing rapid and high spikes in blood sugars. 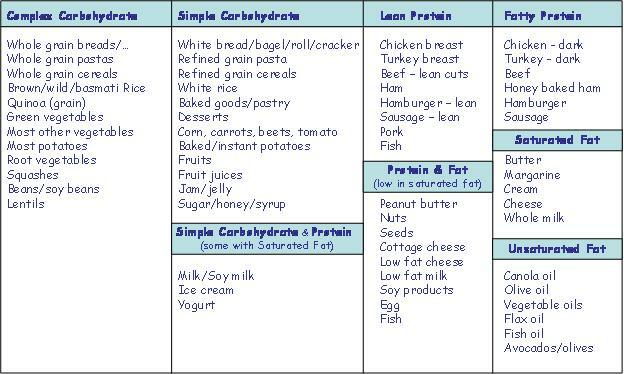 To stabilize blood sugars and insulin levels, you want to eat foods that take longer to digest and have a lower glycemic impact, and these are complex carbohydrates (or slow carbs), which are then balanced with protein and fat. When this combination represents the bulk of your meal or snack, then a little bit of simple carbs won’t throw off the balance or raise that glycemic response. Eat more frequently throughout the day every few hours or whenever you get hungry, evenly spreading out your meals and snacks. At each meal or snack, create a balance of complex carbohydrates, lean protein and unsaturated fat. And if you want foods with simple carbohydrates and saturated fats, add them in small quantities. There is no good or bad food. Many simple carbs for example are healthy, such as fruit or carrots. So instead of labeling a specific food, determine what category it falls into and balance accordingly. Aim for about 50% carbohydrates, 25% protein and 25% fat. Carbohydrates are what primarily fuels our metabolism, so we need them. We also need fat to keep our cells healthy, be our secondary source of fuel, and absorb fat-soluble vitamins and minerals. And protein builds and repairs tissues, amongst other things. The hardest thing to learn is what category does a food fall into. Is it a carbohydrate, and if so what type. Is it a protein, and if so is it lean or fatty. Or is it a fat, and is it unsaturated or saturated. Sometimes it is hard to tell, and you have to look at labels. I gave the group the following chart to help them more easily determine that. I put foods into categories that represented their primary nutrient, like milk as a simple carbohydrate. If you look at the label on your milk, you will see that it is mostly a carbohydrate and that most of that is a milk sugar. And the rest is protein and some fat. The other thing that is challenging is knowing what are the right combinations. There is no right way to do this. Instead pick a meal you typically eat, and see how balanced it is now and what would make it more balanced and have a lower glycemic impact. For example, if you tend to have cereal, milk, juice and fruit for breakfast, you will notice this is very high in carbohydrates and high in simple carbs. When you start the day with a surge of carbs and blood sugars, you will often start a cycle of craving carbs the rest of the day. In this breakfast, there is a little bit of protein and probably a bit of fat in the cereal. To better balance this, choose a whole grain cereal with low sugars (like oatmeal) that you like, pick a milk with a bit higher fat content or add some nuts, pick either the fruit or the juice, and perhaps add a piece of lean sausage. Now it is higher in complex carbs, lean protein and fat. The best way to begin eating healthier is to make minimal changes to the way you eat now. Start by changing one meal at a time or one type of meal during the week, and just as important is to choose what you enjoy eating and tweaking it so it is healthier and just as – or even more – satisfying. This isn’t about going on a diet, it is about making modifications to what you are already doing or your current recipes so you enjoy it more, it is fully satisfying and it carries you for a few hours. In time this will become easier and more intuitive. Each person in the group picked one of their meals and experimented with ways to make it more balanced and healthier. They told us what was in the meal or snack, and then they told us what those items were in terms of complex or simple carbohydrates, saturated or unsaturated fat, or lean or fatty protein. In this way, they could learn how to think in terms of balancing key nutrients (proteins, carbs, fats) and know when they had a healthy meal or snack or not very easily. They all got this down very quickly and many of them noticed how much better they felt and how much more satisfying it was when they had a balanced meal or snack that was primarily complex carbohydrates, lean protein and unsaturated fat. Try it yourself. You will be amazed how easy it really can be and how much better you will feel. Find out what the participants experienced with Balanced Eating and how they are doing in making other healthy changes. Please feel free to add your own comments as you follow along. To participate on your own or in a group, check out the contest website for details and tools at the contest website. To kick off our sessions this week, I asked everyone to share what it was like to get in touch with their fullness the past week and to share in what way they had success in reaching their other goal. In addition to the goal of tracking fullness, each person had set a second goal for themselves in another area of health or fitness improvement. Everyone had a different experience in becoming aware of when they got full and what fullness felt like to them. For some, they weren’t really sure when it was they got full. It felt abstract and wasn’t as simple as one would think to get in touch with fullness. For others, they realized fullness was too familiar a feeling but knowing the stages of becoming full was less easy to identify. Some said the awareness of becoming full helped them to cut back on what they were eating, and for the first time it was effortless to eat less. 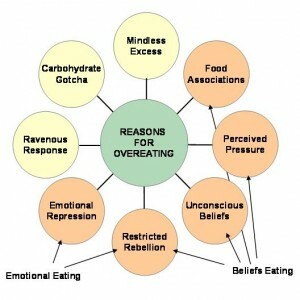 Just being aware changed their behavior around overeating. A number of them also recognized that they could cut back their portions by giving themselves smaller amounts to begin with (like ½ a sandwich, using smaller bowls or plates, serving less food), knowing they could always go and get more when they got hungry again. They then tried that and found they felt so much better. There were a few people who were inspired to change other behaviors related to their eating, such as cutting back the amount of wine they were drinking or stopping before they ate out of emotional reasons. What is amazing is that they did all this effortlessly, simply by observing how they felt, and that was my point. No one forced them to change; they wanted to make changes because it felt better. Read more about their insights about fullness. To help everyone remain conscious while they ate, I introduced them to the hunger scale that you see here. This is a visual gauge to help them notice the levels of hunger they feel whenever they eat. I also introduced them to a Discovery Food Journal, which is available on the contest website for anyone to download. This journal is nothing like the food journals they had seen before. Instead of having them track the foods they eat, I asked them to track each meal and snack by identifying where they were on the hunger scale each time they began and stopped eating. They also have a place to observe any thoughts or feelings that might arise when they eat, as well as any new insights or strategies they come up with. Next the participants shared what went well in reaching the goals they set for themselves in one other area of improvement they are working on. I specifically asked them to focus on their successes, so they could see what they had achieved rather than focusing on what they hadn’t accomplished. By focusing on success, you build your self-confidence in your ability to succeed and you increase your motivation to do more. And that is just what they experienced. Read more about what they did and what they learned. Find out what the group participants have to say about their own personal experience by viewing the comments to this post. Please feel free to add your own comments as you follow along. To make your own changes and participate on your own or in a group, check out the contest website for details and tool.